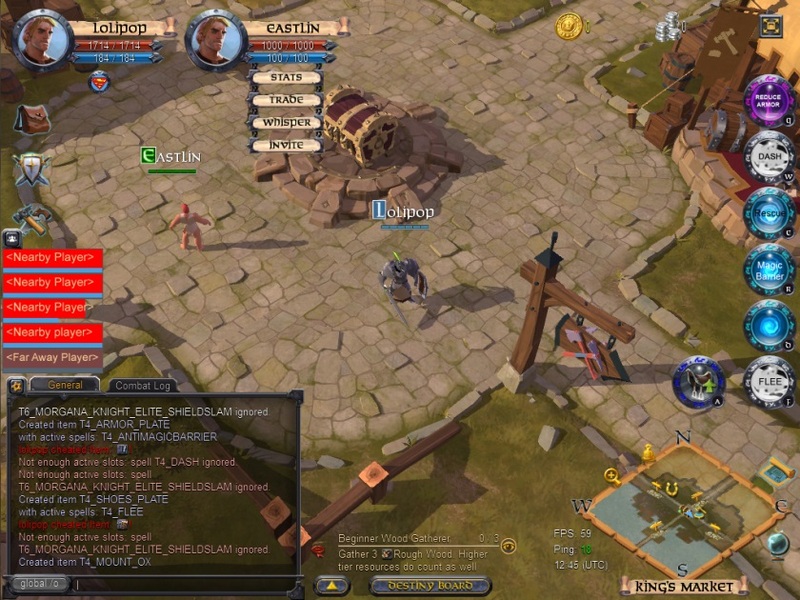 Albion Online Group is essentially a new class of player collective and, similarly to other classes (guilds, alliances), will have its own set of rules and distinguishing features. It will also have its own dedicated menu window and chat tab. Any player can create a group. They cost nothing to establish and players can be invited, kicked, or leave at will. A group is created as soon as the group leader’s first player invitation is accepted. Groups can involve up to 20 players. Players within a group will not be able to attack each other, and members of a group you’re in will be marked with a green nameplate. This distinguishes groups from guilds, which show blue nameplates, and alliances, which show pink and purple. Any player can be invited to a group, regardless of the group members’ guild or alliance affiliations. Every group is governed by a system which equally distributes fame and silver from a mob kill to all group members who actively participated in that kill. This means any group member who pulls aggro on that mob; including active damage assists and heals between group members. This allows a group’s dedicated healer(s) to gain fame and silver while remaining true to their play style, without dealing any damage to a mob. Example: A mob rewarding 64 fame is killed, with 4 players in a particular group on its aggro list. Its 64 fame is divided equally between those 4 players, and 64/4=16, thus each engaged group member will receive 16 fame from the kill. The group leader will be able, via their group window, to manage the group of which they are leader, including inviting, promoting and kicking group members. A leader can choose to promote another group member to group leader, thus becoming a group member themselves. A group will be disbanded as soon as its member number drops below two (there cannot be a group with only one member). Silver sharing from a PvE kill will also be distributed in a similar fashion, though silver will go not just to the engaged group members, but to all group members within a certain range of the kill, currently 50 metres. This allows a group of players from different guilds to team up to potentially make a lot of silver. Guilds can now collaborate on silver farming missions, with the group members from each guild claiming a fair amount of silver from the collaboration. Groups are also just a great way for players to work together and experience cooperative play – without the longer-term commitment to an alliance or guild.